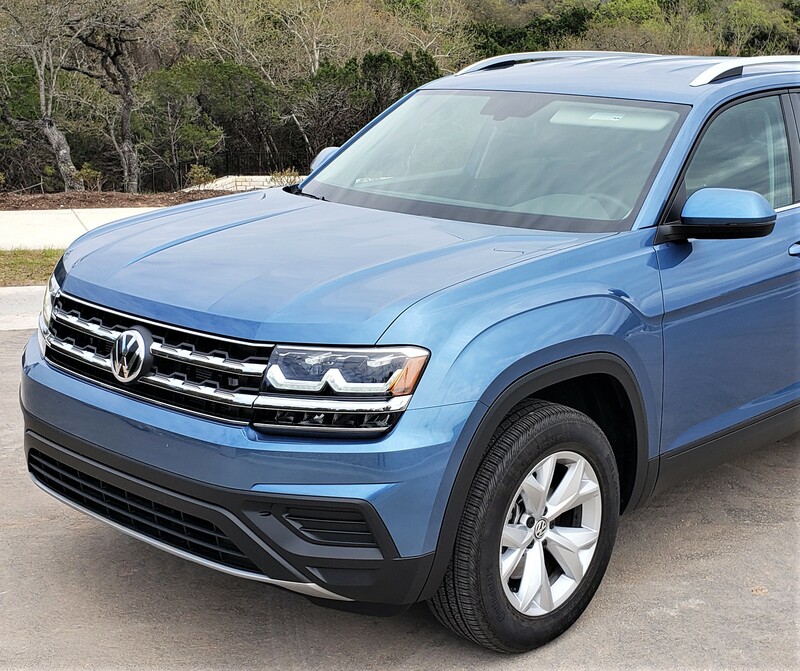 2019 VW Atlas 2.0T S FWD is here! 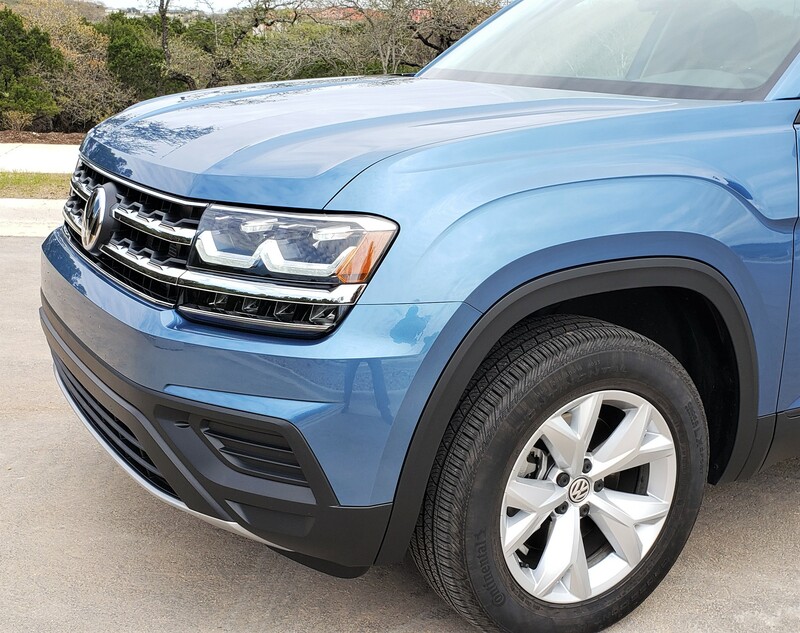 From media professionals to the ultimate expert, the consumer, the new VW Atlas mid-size three-row SUV gets high marks from both. We had also given it high marks from a last year drive test of the top-tier Atlas SEL Premium AWD. Recently VW sent us another Atlas. This time the base 2019 Atlas S FWD for evaluation. Sending us a base model is a departure from typical manufacturer loans. Usually loans are high or even top-tier vehicles with lots of features and functionality – with a price point to match – for the journalist to experience and talk about. For example, the top-tier 2018 Atlas SEL Premium 4Motion AWD we tested previously, had a delivered price of $49,415. We liked it – a lot – and said so. As you would expect a base Atlas S is not as well-equipped, standard or available, as higher trims. Other than some minor accessory choices, the 2019 Atlas S FWD comes one price only – no packages – with delivery just $31,890. So, how would a base model stand up to the top-tier? 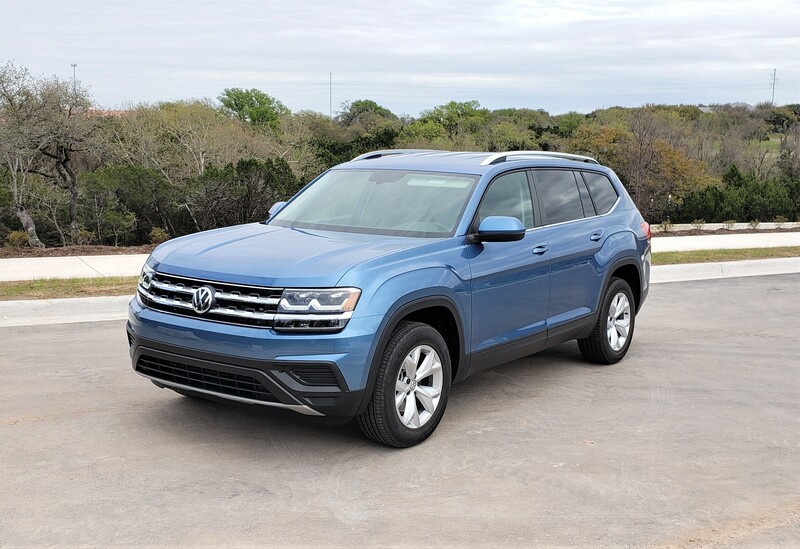 We think the message VW in sending us the Atlas S, was that whatever the trim level and price point a buyer chooses – Atlas delivers a good drive with commensurate functionality, technology, space, comfort and convenience. In the case of the 2019 Atlas S – for the money – we liked it too. 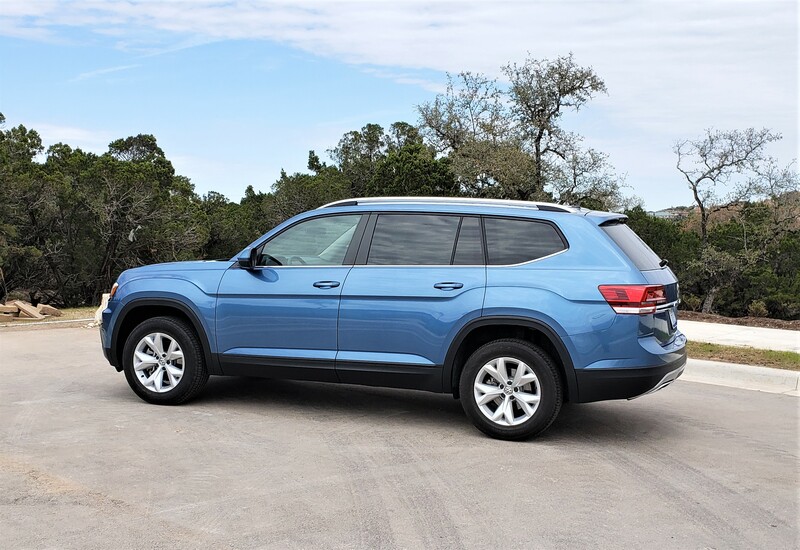 When we looked at the specs on the base Atlas S that VW sent us for test, we were immediately skeptical of the 2.0L four-cylinder Turbo powerplant in a mid-size three row SUV. We quickly dispensed with that skepticism on first drive and, frankly, became advocates for this engine over the course of the week. The EA888 Turbo produces 235 horsepower with 258 lb.-ft. of torque and is mated to their 8-speed automatic transmission with Tiptronic manual mode and Hill Start Assist. From our relatively fresh memory of the V6 powertrain in the 2018 SEL Premium 4Motion AWD tested before, we determined the Turbo equipped Atlas S gives up little – if any – in performance to the V6. Plus, the Turbo fuel economy is 3-mpg better – rated at 20/26mpg city/highway and 22mpg combined. 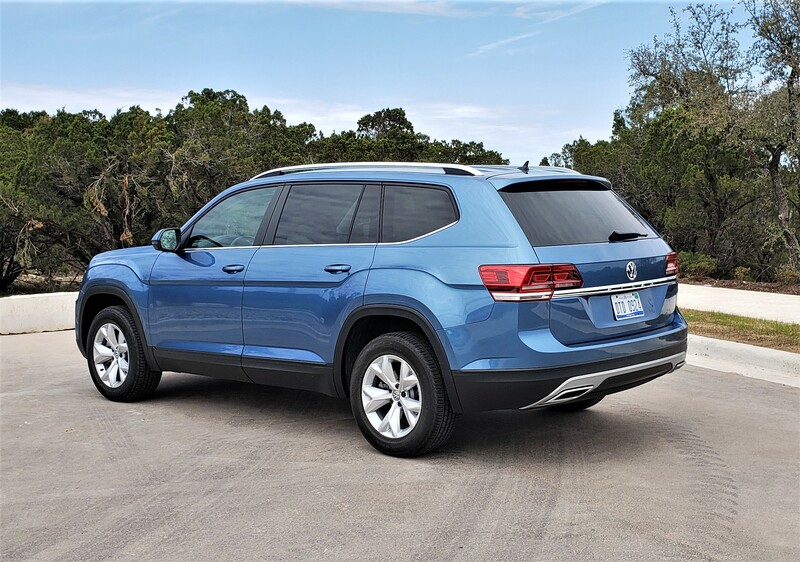 Despite its robust looks, the Atlas – even the base S – drives and handles more crisply than you expect. The ride is quiet, smooth and responsive when accelerating, cornering and braking – and yes – when parking too. Underneath, Atlas is built on the VW Modular Transverse Matrix (MQB) platform with an independent suspension for all four wheels. Up front are coil springs, telescopic dampers and struts with the rear a multilink arrangement equipped with coil springs and telescopic dampers. Ground clearance on the Atlas is 8-inches. Supported by Electronic Stability Control, the Atlas braking system is three-channel ABS with electronic brake pressure distribution. Steering is Electric Power Assist rack and pinion with speed-sensitive variable assist. The turning circle for Atlas is a crisp 38.1 feet making around town driving and parking easy. Keeping Atlas well-planted on the road are 18-inch 5-spoke aluminum alloy wheels mounted with 245/60R18 all-season tires that delivering a comfortable ride. Our Atlas S test vehicle came in a very nice Blue Metallic with body color door trims and rocker panels. High chrome trim on the grille, tailgate and roof rails, matte chrome finish on lower facias and wheels along Black on wheel trims, rocker panels and bumpers – gave it a more premium appearance. Functional elements of note included the standard LED Front lighting (high and low beam plus turn signal), LED Daytime Running Lights and LED Side Markers, Power Adjustable Heated Side Mirrors and a Rear Window Wiper and Washer. 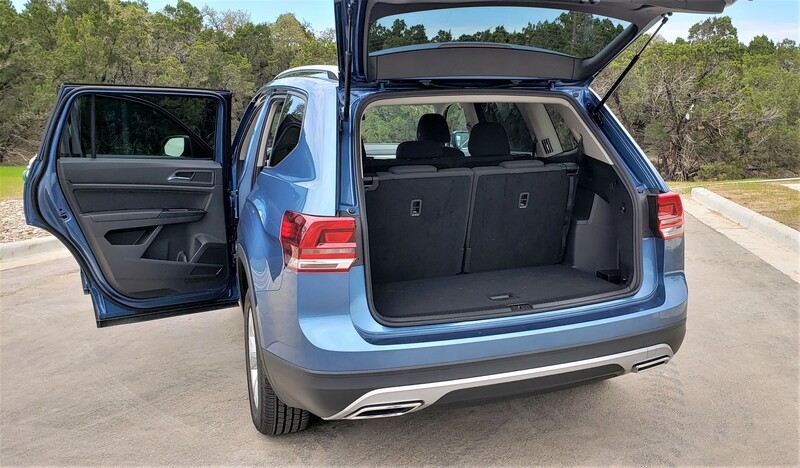 The muscular design of the Atlas exterior translates to lots of space inside giving it a very functional and comfortable cabin even without some of the amenities and convenience features standard or available in higher trim levels. Our Atlas S Black interior and contrasting White uppers used a nice blend of mixed materials and surfaces for a richer look. The steering column is tilt and telescopic and features a leather-wrapped three-spoke steering wheel with multi-function controls. 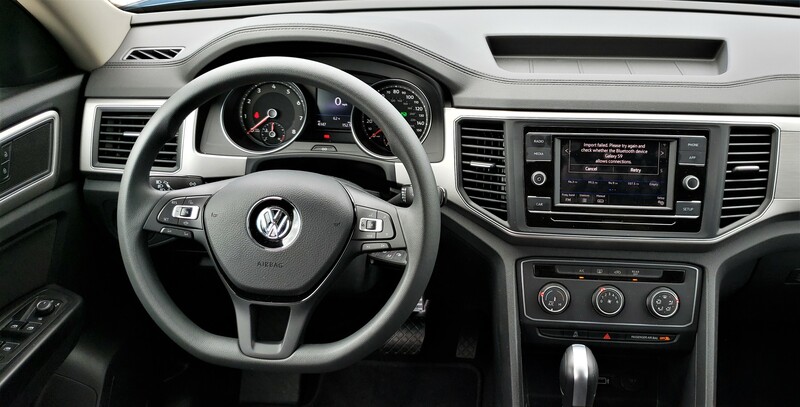 Driver switches and dials on the IP and console are all typical VW – clean looking, purposefully functional and supported by related driver-centric displays. 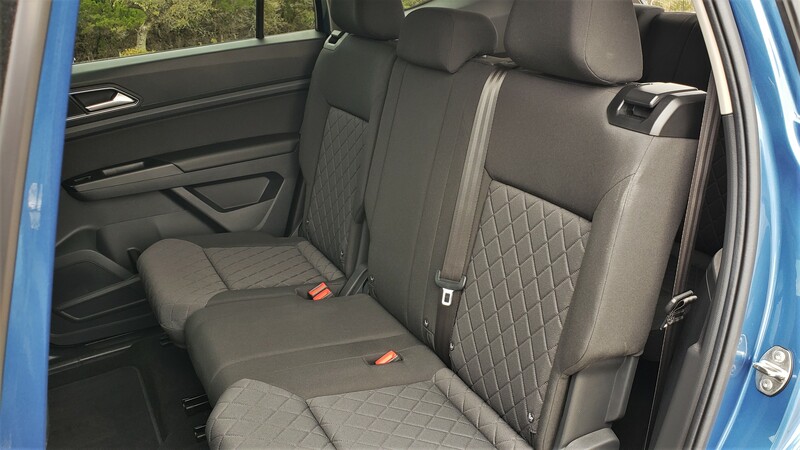 The seat coverings in the Atlas S are a sturdy Titan Black cloth with a quilt-like design on seat and back surfaces. The quality of the cloth plus quilting give it a premium look with comparable comfort. Front Row seating is manually adjustable (including height), 6-way driver and 4-way passenger. 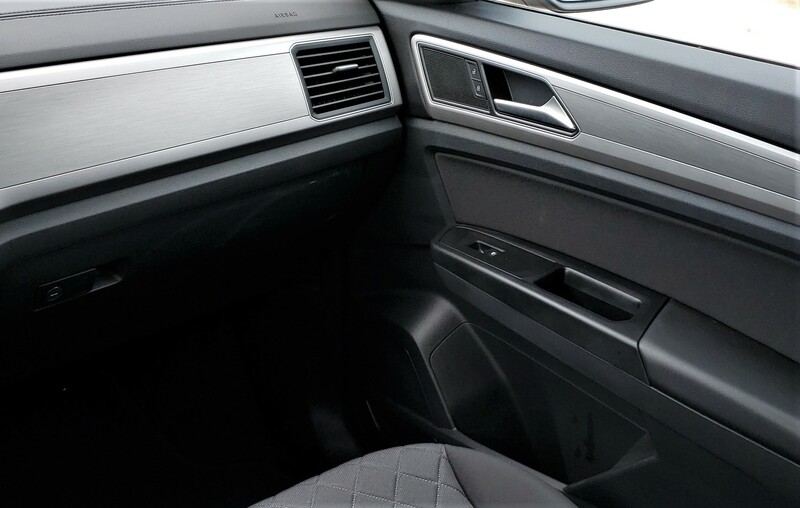 The center console has both USB data and charging ports, armrest, cupholders and storage. As for people room, there is lots of it. 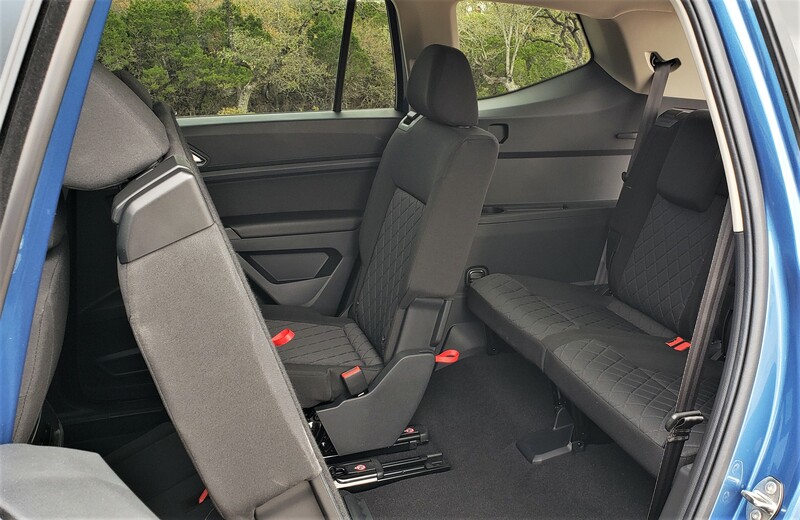 Up front is a generous 41.3 inches of headroom room with a whopping 61.5-inches of shoulder and 41.5-inches of legroom. The second row is nearly as spacious at 40.4/60.8/37.6-inches respectively. The third row is a bit smaller (but still larger than many competitors) at 38.3/54.9/33.7-inches. The second-row bench is a 60/40split with a 14-degree recline, a 7.7-inch front/rear access slide range each side. 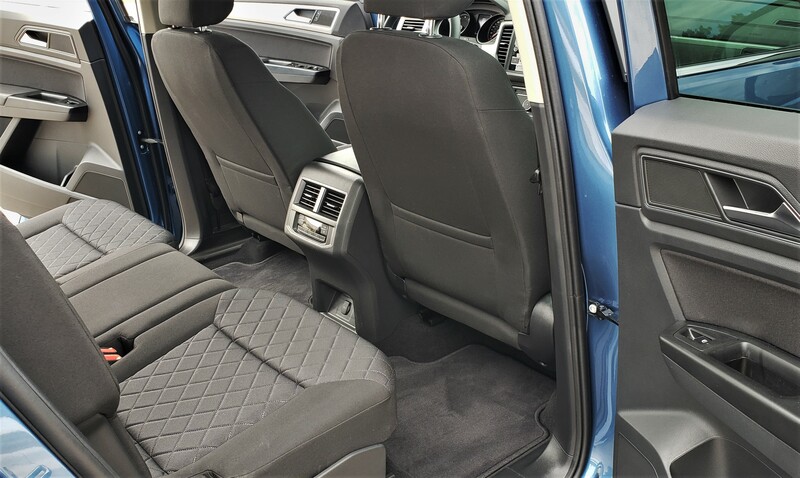 Its unique folding system enables seat adjustment for third row access without removing child seats. Both second and third rows fold flat. Amenities include second and third rows reading lamps, 12V, USB and auxiliary connectivity along with cup and bottle holders and storage nooks. 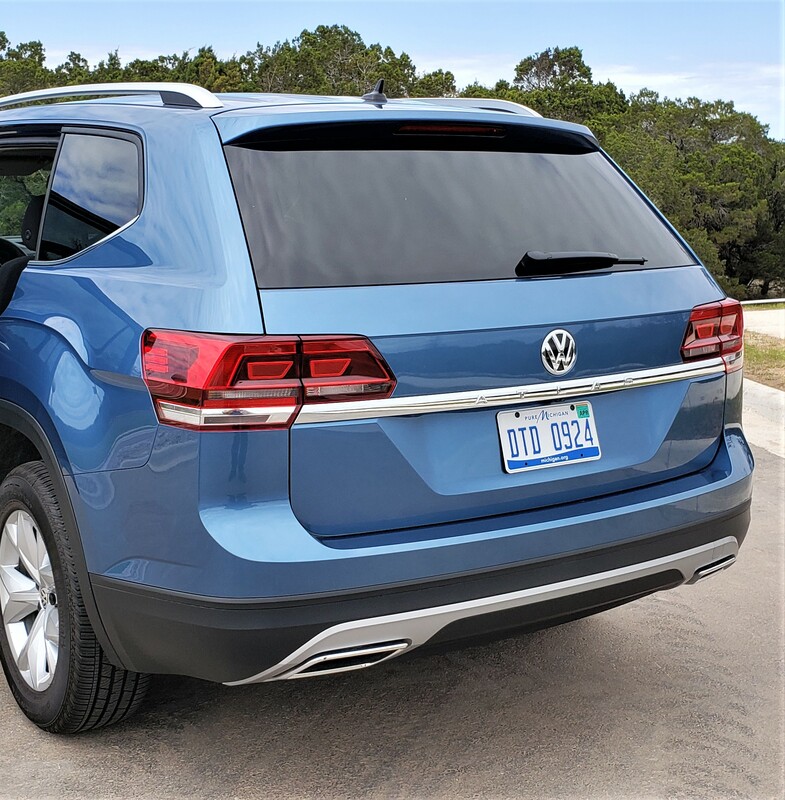 Overall cabin comfort is provided through a Dual-Zone Climate Control with air vents all three rows and second-row control panel for rear passengers. Atlas hauls cargo too. 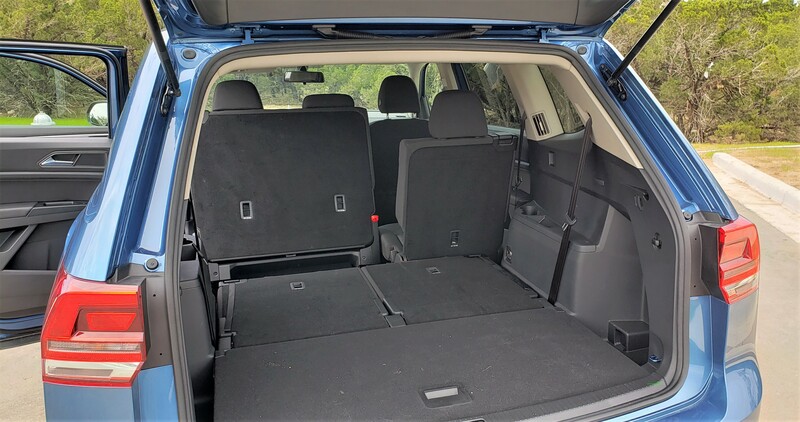 With second and third rows flat, cargo space is a very large 96.8 cubic feet. 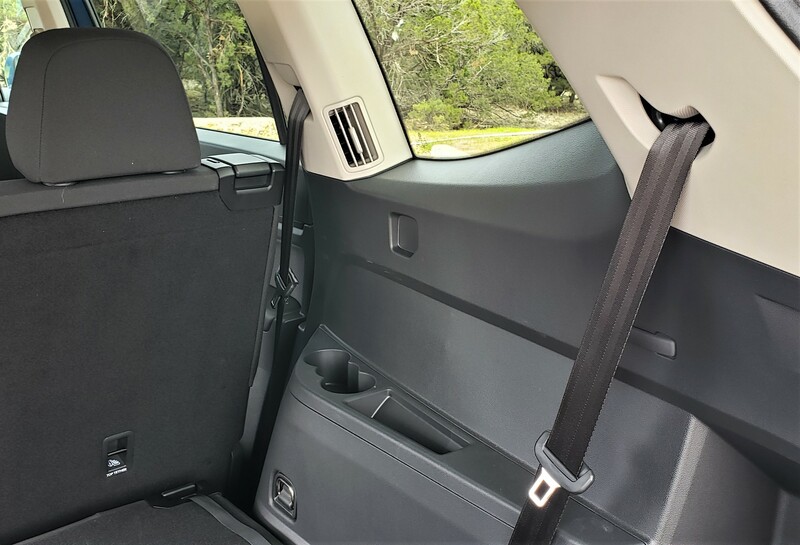 With second row up, cargo space is 55.5 cubic feet and third row up, the space is still 20.6 cubic feet. Infotainment in the Atlas S is spartan but functionally adequate compared to higher trims. It is equipped with the MIB II touchscreen infotainment system using a 6.5-inch capacitive touchscreen Composition Color display. 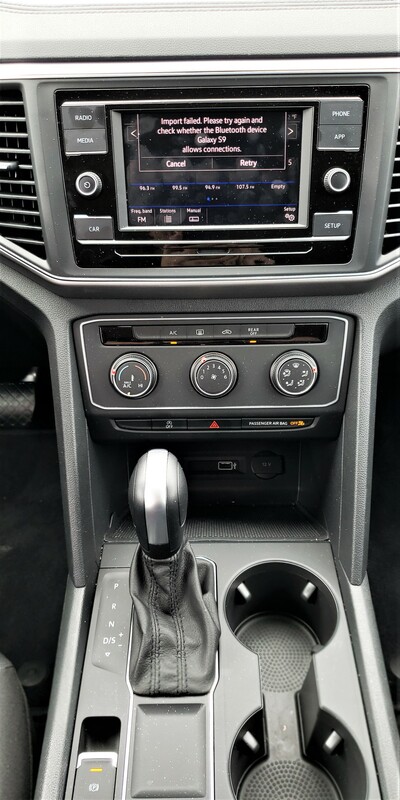 The system offers SD Card and USB multimedia interfaces, a rearview camera and Bluetooth technology along with AM/FM Radio, and Bluetooth connectivity. There is no HD or SiriusXM radio available on the S.
The base S features a 6-speaker audio system – instead of the 8 speakers found on higher trims – was well good enough for our purposes. 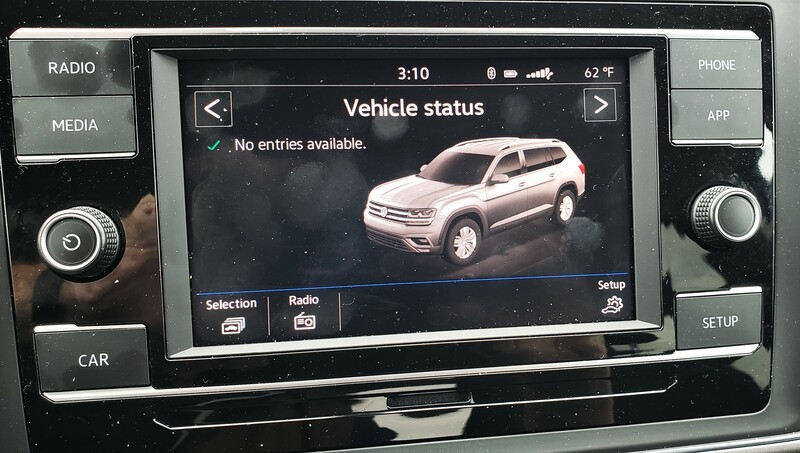 On the technology side, Atlas S – is equipped with the VW Connect and Car-Net and App-Connect System that offers a multitude of available services. For more information, use the VW Connect link at the end of this article. Safety features on the Atlas S include Front Assist Warning (vehicles and pedestrians) Autonomous Emergency Braking, Automatic Post-Collision Braking and Intelligent Crash Response Systems along with Blind Spot Monitor, Rear Traffic Alert Tire Pressure Monitoring. There are seven trim levels for Atlas in 2019. They are S, SE, SE w/Technology, SE w/Technology R-Line, SEL, SEL R-Line and SEL Premium. The base S FWD is the only trim powered by the VW 2.0T Turbo (MSRP of $30,895). It is also available in 4Motion AWD powered by the 3.6L V6 for $3,200 more. All other trim levels are powered by the V6 and come in both FWD and AWD – except for the top-of-the-line SEL Premium which is AWD only. 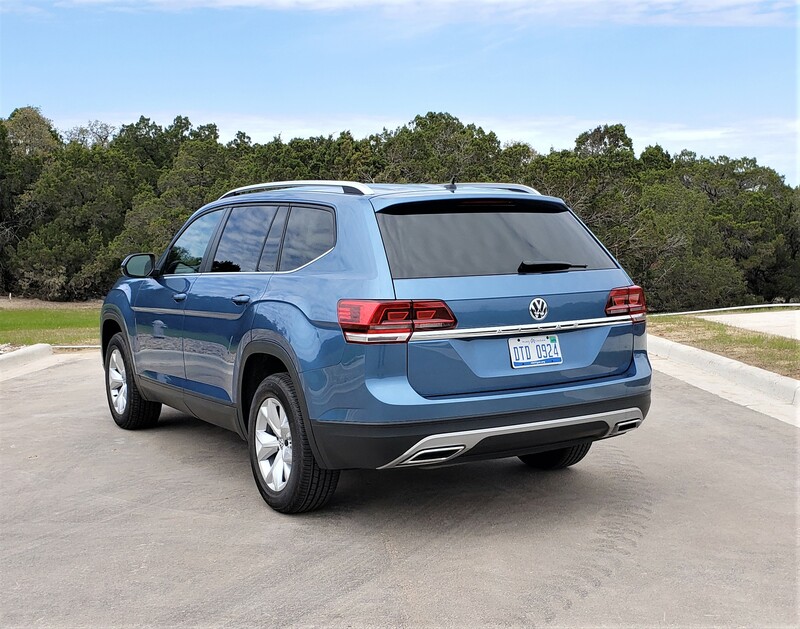 VW Atlas Cross Sport 2-Row SUV in 2019?